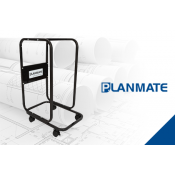 Planmate offers 21 different mobile plan trolleys from the 5 biggest brands Planmate, Planhorse, Hang-a-Plan, Draftex and Universal. 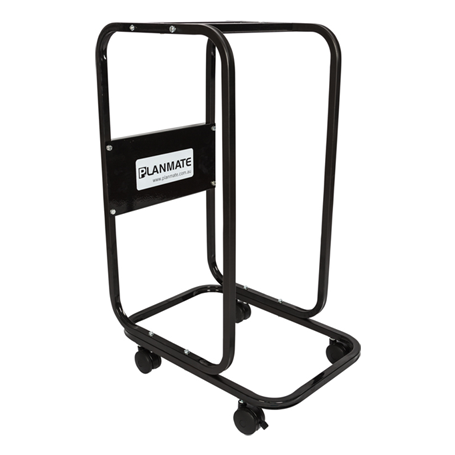 All Plan trolleys feature castor wheels for ultimate mobility of your planfiling system. The Clamp hangs on Mobile Trolleys which occupy a very small space whilst storing up to 2400 sheets vertically. The Trolley provides high density vertical storage with easy, quick filing and retrieval. 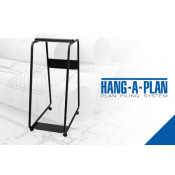 Plan Trolleys are also referred to as Planracks or Mobile Planfiling systems, rolling stand, Plan file Trolley, Mobile Blueprint stand, Mobile Plan storage or Mobile Plan Hanger. 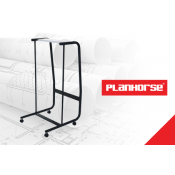 Plan Trolleys can be used in the office or on building and constructions sites. Most brands offer different trolleys in plan clamp capacity, from 10 clamps up to 24 plan clamps per trolley. Depending of the size of the trolley , each rack can hold a mix of different plan clamps and drawings. Manufactered and tested to the highest quality standards the Mobile Trolleys are non obtrusive and enable a dramatic reduction in storage and retrieval time. Sheets are organised and easily accessible while the systems saves 90% of the floor space needed by other systems. Not all brands are (backwards) compatible/interchangeable in clamps and racks. Please call our office on 0800 425 452 to check compatibility and interchangeability of clamps and trolleys of each individual brand. 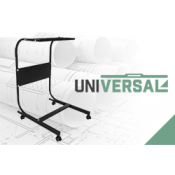 The mobile trolleys eliminate the frustrations in-herent in filing drawers, vertical plan cabinets and drop lift trolley systems. Hanging and removing clamps from the Trolleys is quick and simple. Simply insert a plan drawing hanger from the font, tilt the clamp then straightens to secure the clamps front stop. Reverse the procedure when removing. No annoying swing brackets or end supports to contend with.